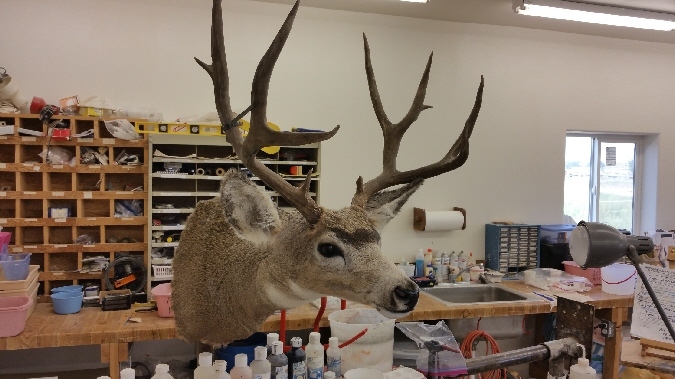 This Mule Deer the customer paid $0.00. 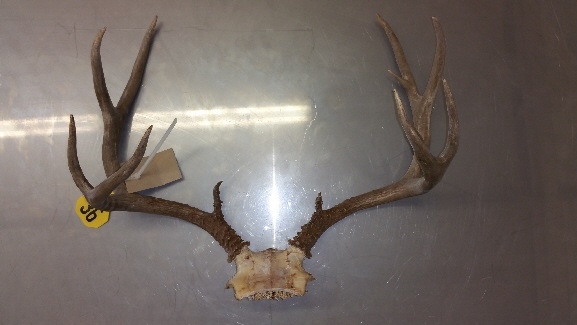 I HAVE the cape (or head skin) for the following Mule Deer Antlers... We CAN DO A HEAD MOUNT with the rack shown below... It's NOT mounted YET; I have the cape frozen waiting to be tanned & mounted when a deposit of half is paid. I will GIVE YOU the antlers and cape for FREE -- IF -- YOU PAY the price for a Mule Deer Head Mount for $600.00 / $300.00 Deposit will start the mounting process for you. Below this picture there is a Head Mount finished for another customer. Your finished mount will look similar to it. From widest part of rack 23 1/2"
This is the rack that will be on YOUR head mount" IF you can't afford to pay the $300.00 in one shot; we allow minimum payments of $30/Month. Click $100 Bill below to review our payment plan. Can supply picture of hide but their is not much to see because its currently salt dried and inside out. Excellent Condition. Will be tanned BEFORE a mount is done or also tanned too if just tanning the hide only option is chosen.